Now our wedding is done and dusted and we start life as a Mr and Mrs I thought it was about time I shared the gifts we chose for our guests – now they’ve received them and I don’t spoil the surprise. Looking up on traditional gifts for the family of the bride and groom there isn’t really anything you have to pay your best man or the father of the bride but we wanted to gift our closest family and friends with some things that were special and also some items that were different from what they might have been expecting – enter notonthehighstreet.com. I’ve used notonthehighstreet.com before to primarily window shop because it’s like a slightly more commercial version of Etsy and I find the website itself to be so well thought through and laid out that I was making myself wish lists even before we started putting the finishing touches into tying the knot. To be completely honest with you I’ve used this website for inspiration for a few wedding bits and then hunted down cheaper versions on places such as Amazon but as a great money-saver for small items having a visual board of pin-worthy gifts and crafts is, there’s still some items on notonthehighstreet.com you can’t get for an equal quality elsewhere. 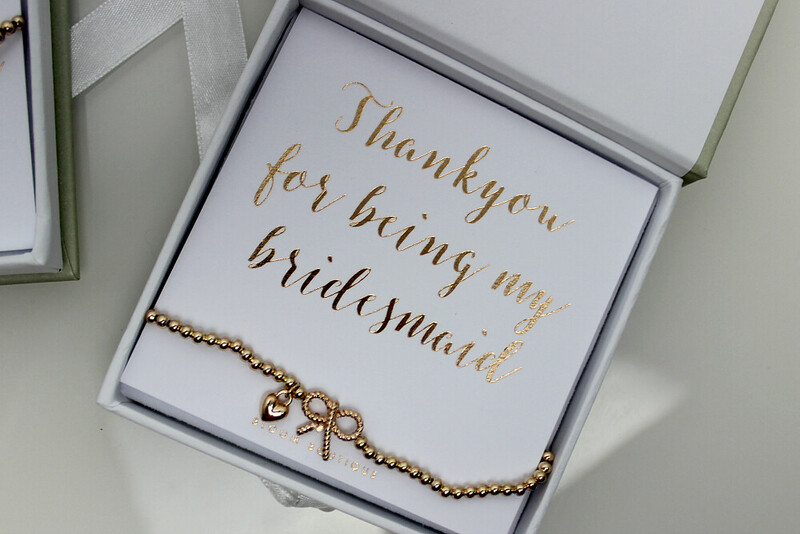 What really dragged me in were these personalised thank you bracelets from Bloom Boutique. With everything on there once you add some custom options on items for sale the price does shoot up but I found with the options I wanted on my order the prices were still very reasonable. 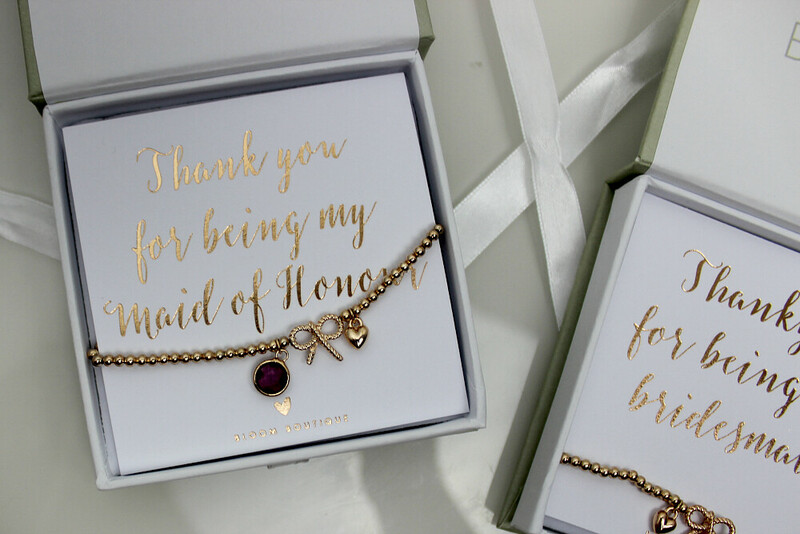 I completed my orders at under £20 for each of my bridesmaids and with something special for my maid of honour in rose gold with the custom gift boxes and they looked stunning. From the offset we wanted our flower girl to have a little token of the day that she could keep for years to come and buying her a child-sized bracelet in the same style was a lovely touch, she raved at having the same gift to open as the adults and the packaging was just as precious for hers as well. The presentation of these bracelets was beautiful and very upmarket for the price paid, they looked bespoke and special enough as thank you gifts for our important guests. Unfortunately the range of decent mother of the bride gifts on notonthehighstreet.com are a bit sparse if you have a mother like mine who is difficult to buy for unless it’s something from Cath Kidston. 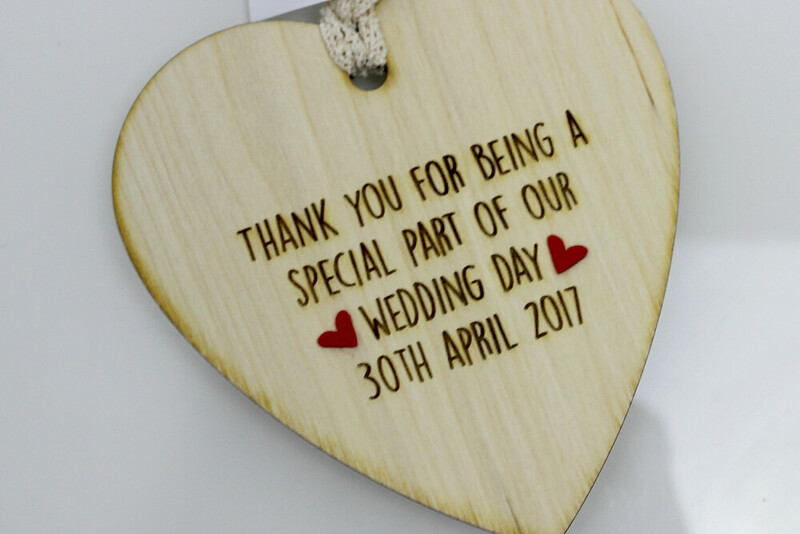 Nonetheless I was adamant that she had to have something from us to remember our special date and after quite a bit of searching we finally settled on this personalised wooden token by Just Toppers. My Mum loves little knick-knacks for her home so I know that she’s going to hang this up somewhere everyone who visits can see it and I thought it was a sweet touch for a decent cost too. We also gifted my Mum with a huge bouquet of flowers on the day for all of the hard work she’s put into our wedding for us and this was a great additional to a little gift bag with a bottle of her favourite alcoholic beverage in with it too. 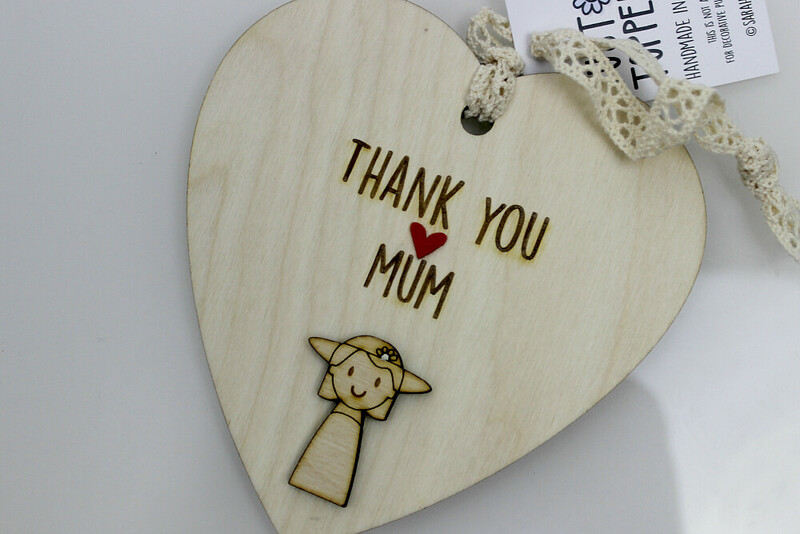 Right, so I did find a custom ‘Mother of the Bride’ and ‘Mother of the Groom’ hanging charm for both of our Mum’s houses but by the time I came to buy them both they’d sold out so I had to settle for the wooden token for my Mum and then something else for my Mother-in-Law. 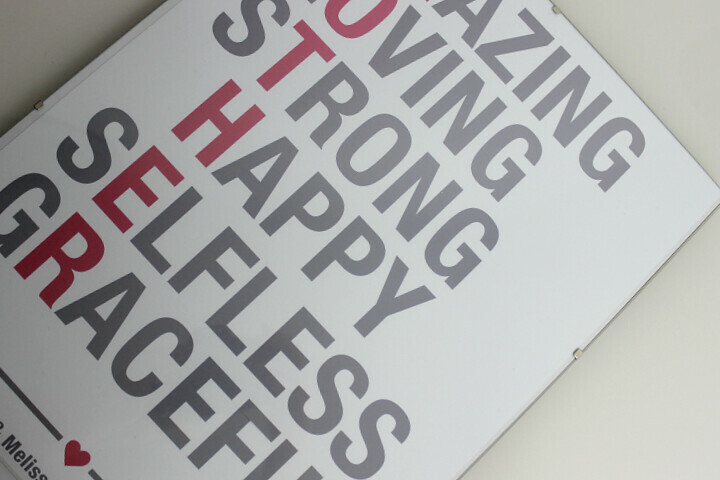 Luckily, Rick’s Mum loves a custom sign or poster so we both chose this personalised Mother print – even if I did forget to order a frame to come with it… Oops. The customisation options for this product are almost endless as you can choose whatever colour scheme or font set you want for the recipient so it can fit into any decor or style preference they have in their home. Delivery was super-speedy and the print looks good enough even without a frame. This wasn’t a gift that was especially categorised for wedding guests on the website but it could still be customised hence we could still add our names and wedding date to the print for that extra touch. Because I had such a big custom order to make when I purchased I forgot to add a frame for this print but this was a complete error on my part as in the basket you can double (and triple) check your customisations on each order without causing havoc so I had to order a frame elsewhere. Thankfully there is an easy to use communication tool throughout the website and on your account dashboard so I chose to have the frame sent out from the seller for an additional cost after my unframed print arrived – my bad. 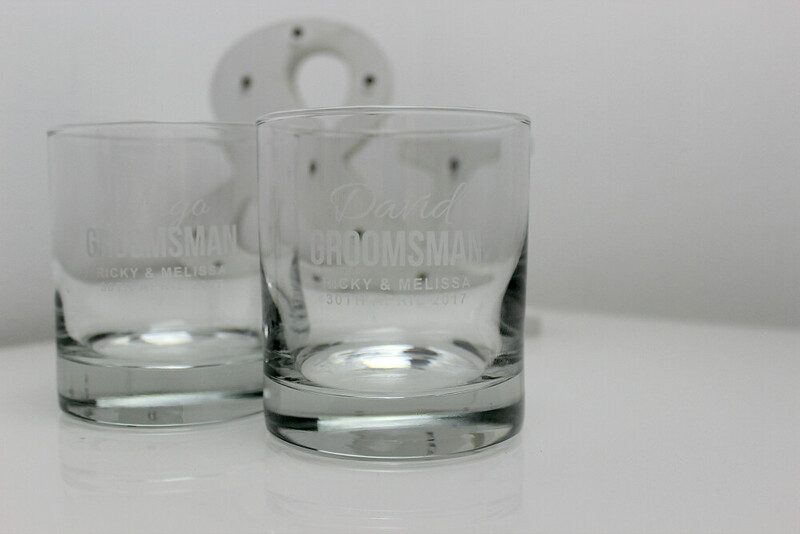 There is quite a wealth of gifts you can get the groom’s party in the gift category and like almost everything they can be customised with names and dates. 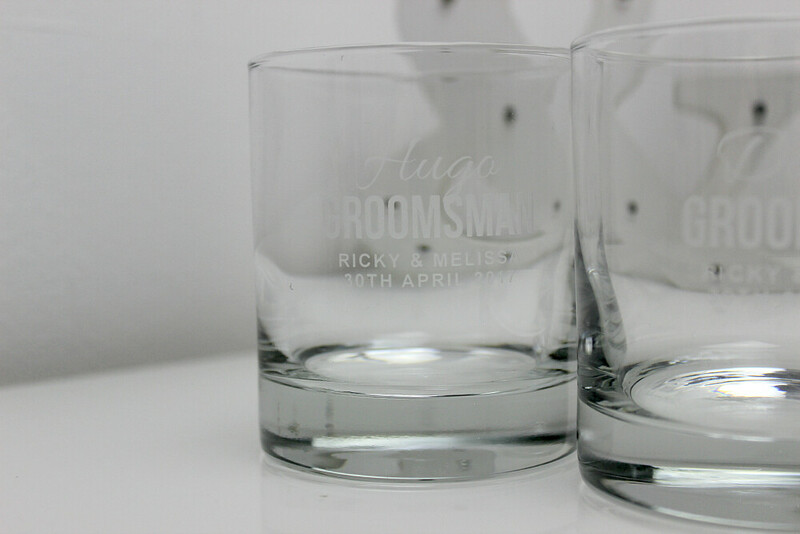 We found these personalised groomsman tumbler glasses from Becky Broome and I really liked the style of text on them especially so we added two of them to our order. They arrived very quickly and without their gift boxes as we didn’t want to pay the additional costs and they looked so special just as they were. These went into gift bags with some mini-bar sized whisky bottles from the supermarket and were really enjoyed by her guests so we were very happy. Even if they sit in a cupboard never seeing daylight again or get used as pen holders we really don’t mind, it’s all about having that little something for our family and friends to open on the day that simply said thank you for being a part of our journey together. I’ve been using notonthehighstreet.com religiously since I made my mega-order for these gifts as I had my Mum’s 50th and my little brother’s 21st birthday all before our April wedding. The account dashboard is so simple to use and the calendar function is great for birthday and anniversaries I always tend to forget about because if I fancy a bit of occasional online window shopping I can find gifts and add them as I go through the months and then receive a reminder a few weeks before the date so that I order in enough time for the special day. I hadn’t been on notonthehighstreet.com for a few years since it launched and I’m very impressed with how it’s developed to become a clean and tidy place to find bespoke gifts and homewares, I’m sure that we’re going to become regular customers for a while to come. Honestly Rick and I were really happy with the gifts we chose and the delivery was chuffing amazing, even though our orders came from different suppliers they all arrived within the same few days of each other. Have you ordered from this website before? What did you think? Let me know in the comments. Please note, this is not a sponsored post. I have discovered and used this service myself without any gain from the company.